It’s a little sad for me that Caleb (8) no longer believes in Santa. It’s even more sad that he stopped believing in Kindergarten! I was horrified and felt he really got robbed of Christmas as a child. I really don’t want Davis and Beckham to have that same experience, so I’ve been brainstorming ways to keep Santa real for as long as possible. I decided that I wanted the kids to each get a letter from Santa in their stockings this year. To make it more believable though I sent out an e-mail to their teachers at school, church, Grandparents, and my friends, asking them if they saw one of my kids do something nice to please e-mail me back. That way there would be things in the letter that Mom and Dad wouldn’t know about. 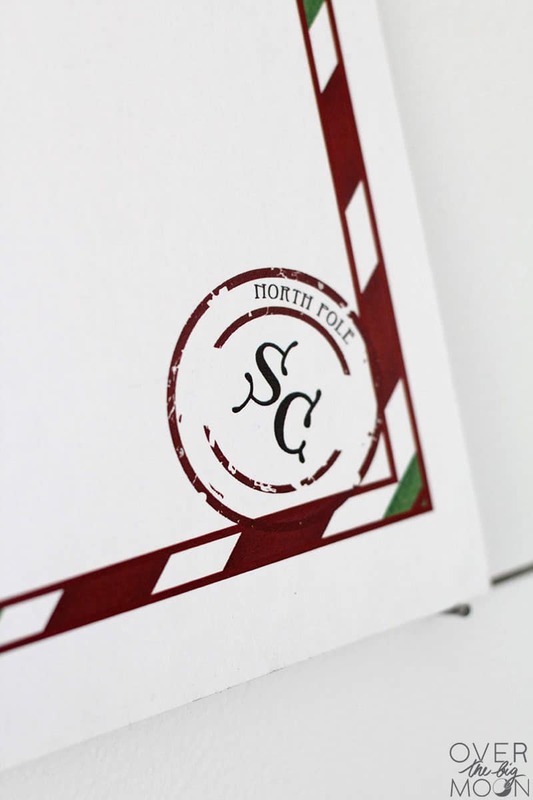 Next I made official North Pole Stationary! I chose the plain white background for my boys letters and then printed it on a really nice parchment cardstock. I am so excited for them to read these! Just like with the Self-esteem books, I feel the best gift we can give our children comes from a feeling inside and not objects. Even though Caleb will know its from us, I know it will make him really happy to know that we hear the good things he does when he’s not at home. BTW it’s really fun to write a letter as Santa! Here is my letter to Beckham if you need an example to get your ideas going! Then I rolled it up, tied it with a ribbon, and they were ready to be delivered in their stockings Christmas Eve! 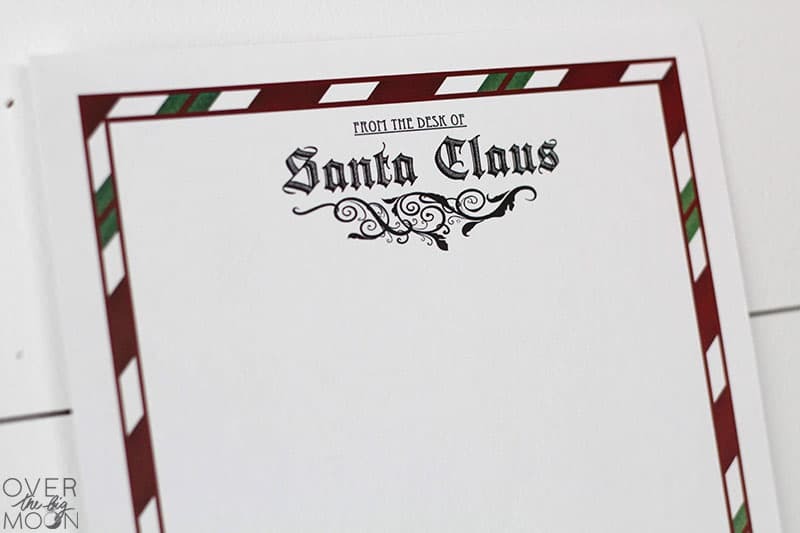 I am going to start a binder that I keep all the past letters from Santa in so they can read them every year. 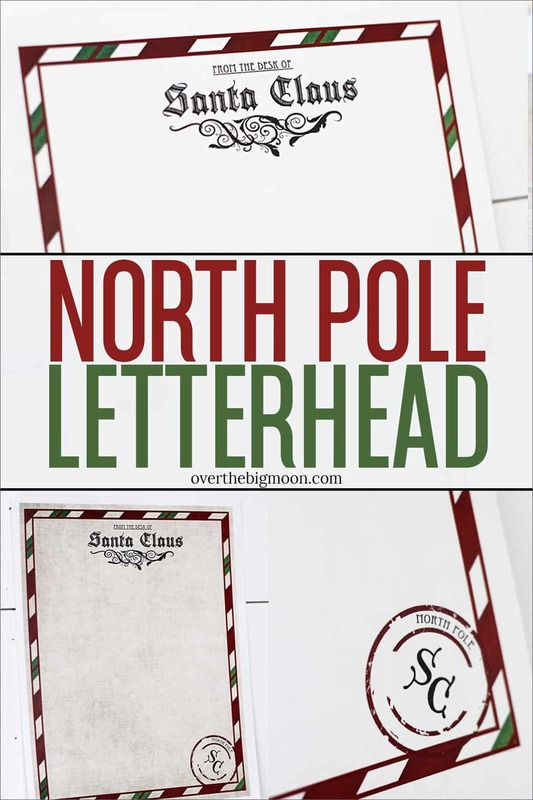 If you want to write a letter from Santa for your child(ren) you can download the printable North Pole Letterhead below. Then you can write your letter in any type of Word document and then have it print on the letterhead! If you have an editing software, like Photoshop Elements, then you can just import the letterhead in there and then add your text and then print it all at the same time! 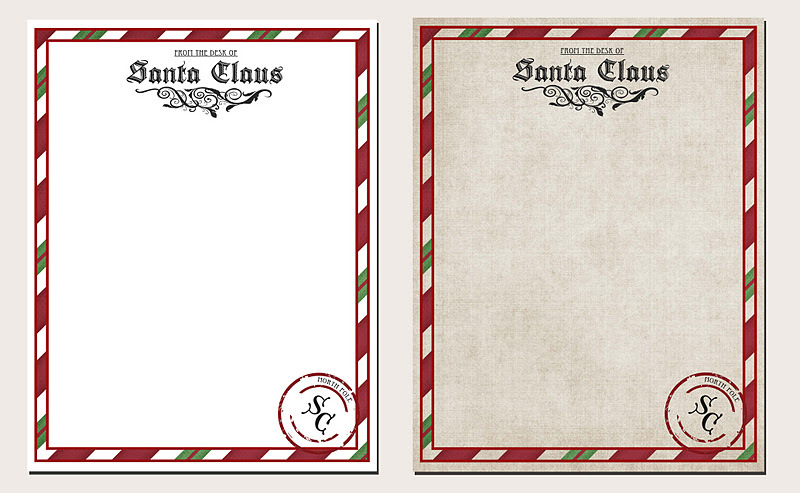 The stationary even has a fun little Santa Claus stamp on the bottom right hand corner! *Pam asked what the carrot wreath was I talked about in my letter to Beckham. I saw it on How Does She and we have one in our freezer just waiting to be put out on Christmas Eve. Looking for some other fun Holiday traditions? What a nice idea! 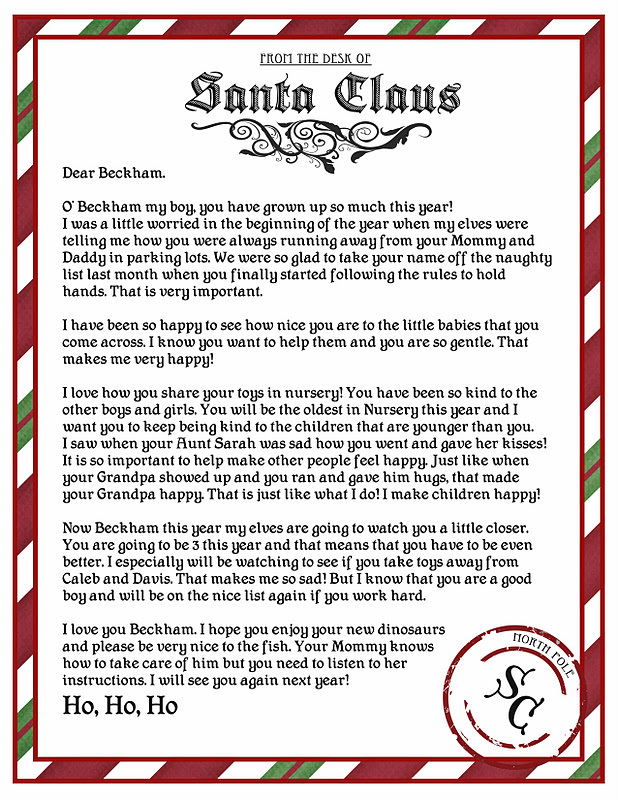 My kids are grown, but I always did Santa letters for them when they were small. It might be fun to send them letters to their own places now as adults just for kicks. Thanks for sharing! Oh thank you for this!! This is our first Christmas with our little boy actually GETTING it!! We’re having so much fun and this template is perfect!! What a GREAT idea reaching out to people that your kids interact with on a daily basis!! That makes it even MORE Magical! Love this. Thank you! This is perfect paper. “The Head Elf” has always delivered a letter to my kids about a week before Christmas…reminding them of the spirit of Christmas and all the good things about each child. He delivers it directly to the mailbox for them to find on their own when they gather up the Christmas cards. They are enthralled! This is an excellent idea! It’s exactly what I was looking for for a letter to my niece and nephew from Santa this year. Thank you! i have just downloaded this to a pdf file, how do i add text to it please? i think its fabulous. I use Photoshop elements but there is also free photo editing software that should work. You can also print this, then type it in Microsoft word leaving large borders and then print your text onto the stationery. Thank you–this is perfect! So many cartoon-y things out there, but this is very elegant! I linked this in my blog (crafterjenn.wordpress.com). I made some variations to it, but think it’s absolutely amazing. My youngest is just getting old enough to really enjoy Christmas so this was the icing on the cake. Thank for sharing such awesome stuff..I also linked this in the post as well. Thank you so much for sharing these! I am so glad I found your site. Ironically my 7 year old’s name is Beckham, so I about died when I saw this! Thank you again! I can’t get this letter to download. It sent me to 4shared and I signed up … and? it still wouldn’t download … could you possible send it to me as an attachment? I wanted the textured one. >Thank you so much Lisa! I love using your printables and appreciate that you share them. Merry Christmas! I am uploading the new files to for shared as we speak! >Hate to seem like a Scrooge, but I don't want you to look back later and notice these mistakes. In the first paragraph it says "of the naughty list" should be off. Then it says "finally starting listening" should be started. Then in the fifth paragraph it says "be nice list" it should be on the nice list. Trust me I truly appreciate, your work. I have downloaded many of your preschooler packs and know you are creative and a good writer. Amazing work on this letter, using actions throughout the year. >I love your blog, ideas and all of your printables! 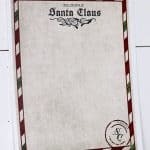 I would love to use this one as well, but isn't it spelled Santa Claus?